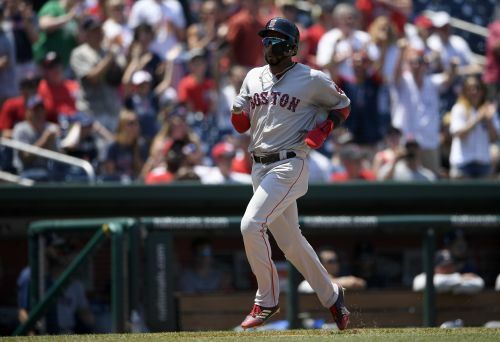 WASHINGTON (AP) — Jackie Bradley Jr. drove in two runs, Eduardo Rodriguez struck out six in six innings and the Boston Red Sox beat the Washington Nationals 3-0 on Wednesday to complete a three-game sweep. A throwing error by Adam Eaton on Bradley's sacrifice fly and a wild pitch by Ryan Madson (2-4) in the seventh inning contributed to Washington's 17th loss in 22 games. NEW YORK (AP) — Giancarlo Stanton hit a three-run homer and CC Sabathia pitched six effective innings, leading the Yankees to the victory. PHOENIX (AP) — Yadier Molina and Yairo Munoz homered, Miles Mikolas threw six strong innings and St. Louis broke loose late to beat Arizona and take two of three from the first-place Diamondbacks. Molina's three-run shot on the first pitch from reliever Fernando Salas highlighted a five-run seventh inning after Arizona had nursed a 2-1 lead through six. Tommy Pham drove in three Cardinals runs with a double and two singles. ARLINGTON, Texas (AP) — Evan Gattis drove in Jose Altuve with a sacrifice fly in the 10th inning, sending AL West-leading Houston to the road win. Gurriel homered, doubled and scored twice as the Astros overcame an early four-run deficit. Collin McHugh (4-0) pitched three scoreless innings, and Ken Giles got three outs for his 12th save. Texas' Shin-Soo Choo homered and singled to extend his on-base streak to 44 games, the longest in his career and in the majors this season. LOS ANGELES (AP) — Rich Hill earned his first win in three months, Yasmani Grandal and Chris Taylor drove in three runs apiece, and the Dodgers swept the Pirates for the second straight year. CHICAGO (AP) — Javier Baez stole home, Willson Contreras hit a tiebreaking homer and the Cubs earned their sixth straight victory. OAKLAND, Calif. (AP) — Stephen Piscotty doubled three times and drove in three runs, powering Oakland to the win. Khris Davis added an RBI single for the A's, who have won 14 of 17 to move a season-high nine games over .500. PHILADELPHIA (AP) — Aaron Nola stuck out nine in seven innings, Nick Williams hit a two-run homer and the Phillies beat the Orioles to sweep a two-game interleague series. Orioles right-hander Yefry Ramirez (0-2) gave up two runs — one earned — and one hit in five innings. TORONTO (AP) — Todd Frazier hit a two-run homer for the Mets, and Brandon Nimmo reached base three times. Frazier gave the Mets the lead with a drive to center field off Marcus Stroman (1-6) in a five-run fifth inning. Seth Lugo (3-3) pitched three innings for the win. Jeurys Familia earned his 16th save in 20 opportunities. Wilmer Flores had two hits for the Mets, who had lost 11 of 13. Kendrys Morales homered for Toronto. Stroman was tagged for six runs and six hits in 4 2/3 innings. Brad Miller homered to right-center off Jose Berrios (8-7) to lead off the bottom of the seventh for the Brewers. Two batters later, Orf sent a 2-2 curveball down the left-field line for a two-run lead. DENVER (AP) — Chris Iannetta homered in the seventh, Tyler Anderson pitched eight stellar innings and the Rockies beat the Giants for the three-game series sweep. KANSAS CITY, Mo. (AP) — Trevor Bauer pitched effectively into the eighth inning, and Cleveland finished a three-game sweep. Michael Brantley had an early RBI double and the Indians scored all their runs in the first three innings on only one hit. Bauer (8-6) struck out eight in 7 2/3 innings. The plummeting Royals have lost six straight and 18 of 21. Trevor Oaks (0-2), recalled from Triple-A Omaha to take Ian Kennedy's spot in the rotation, allowed three runs in four innings. Cody Allen worked the ninth for his 18th save in 19 chances. CINCINNATI (AP) — Starting pitcher Sal Romano dropped down a suicide squeeze during Cincinnati's six-run fourth inning. Jesse Winker and Jose Peraza each had a two-run single during the big rally, and Scooter Gennett also singled in a run. The Reds overcame Daniel Palka's third home run in two games to win the three-game series and complete a 4-3 homestand. Yoan Moncada added a two-run homer for the White Sox, who have dropped five of seven. Dylan Covey (3-4) lasted just 3 2/3 innings. Romano (5-8) was charged with four runs in five innings. Jared Hughes got five outs for his sixth save. MIAMI (AP) — Jose Urena and three relievers combined on a four-hitter, and Miami shook off the hangover from a 16-inning loss. The teams took the field barely 12 hours after the Rays won a 5 1/2-hour marathon. Urena struck out six in five innings. Drew Rucinski (4-1) pitched two innings for his second win in the series. Brad Ziegler pitched around a walk in the ninth to earn his 10th save. After using nine pitchers Tuesday, the Rays called up right-handers Andrew Kittredge and Ryan Weber from Triple-A Durham as reinforcements. Weber (0-1) allowed two runs in five innings and was optioned after the game back to Durham.